This year’s Holton Christmas Homes Tour features a variety of homes – new and old – decked in décor just as unique as their homeowners. The homes tour is set from 10 a.m. to 3 p.m. Saturday, Dec. 12, as a fund-raiser for the Holton/Jackson County Chamber of Commerce. The tour features homes owned by Brian and Nicole Meerpohl, Kerwin and Carolyn McKee, Gerald and Cheryl Copeland, Pat and Doyle Spohn and Joy and Dale Clements. This is the second of two articles detailing the decorated homes. The first article was published in last Wednesday’s edition. Dale and Joy Clements, 119 Iowa Ave.
More than 100 years old, the home owned by Dale and Joy Clements on Iowa Avenue features beautiful woodwork and a variety of traditional Christmas decorations. This is the third time the home has been featured on a holiday homes tour. The two-storied home will feature a Christmas tree in every room decorated in a traditional style. “I like antiques and older items, but I also like newer pieces,” she said. A tree in the couple’s dining room is covered in different ornaments that have the word “joy” on them. “Since it’s my name, people have given me all these ornaments throughout the years,” she said. On display is a nativity set purchased from Signa Magaffey at Lee’s Flower & Gift Shop many years ago. Groups of snowmen can also been seen in the dining room. Above the doorway trim in the room, the Clements have displayed numerous pieces from their Cat’s Meow Christmas village set. The three upstairs bedrooms feature greenery and trees. One of the guest bedrooms also includes Joy’s collection of Boyds Bears stuffed animals. 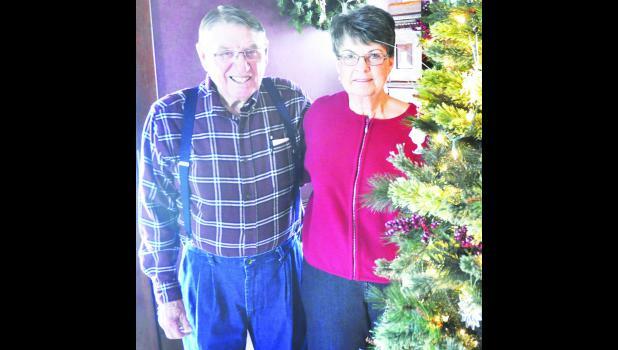 The Clements moved into their home 51 years ago after they sold their farm. 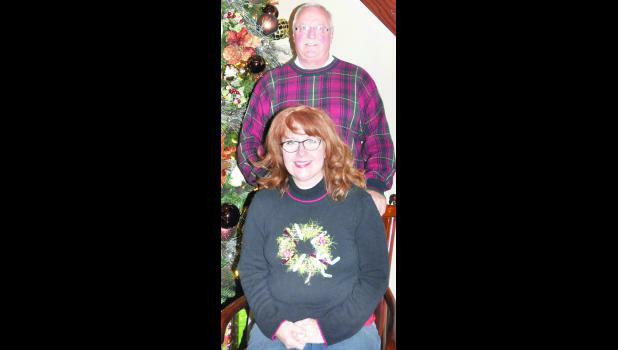 They raised their four children in the home and enjoy hosting them and their six grandchildren for Christmas each year. Dale is retired from Goodyear Tire & Company but works a few hours a week as a courier for Denison State Bank. Joy is retired after working for the senior citizens center for 28 years. Kerwin and Carolyn McKee, 10949 238th Rd. Several years ago, Kerwin and Carolyn McKee salvaged several large wooden display cabinets previously housed in a science classroom at Holton High School. The only problem was they didn’t have anywhere to install them. So they built a house. This is the sixth Christmas the McKees will spend in their craftsman-style home located just off of 238th Road. Lighted garland runs up the staircase banister, and a large tree on the first floor of the home includes a variety of silver, gold and copper-colored decorations. The five display cabinets from the high school house Carolyn’s collection of clocks and birdcages. “If people look closely, I have several Christmas corsages sprinkled throughout the house that were worn by my aunt Dorothy,” she said. A cabinet in the couple’s bedroom is backlit to display 13 glass Fenton Christmas trees that were purchased at expressions. “They were Christmas presents from Kerwin,” she said. Upstairs, a tree is decorated in ornaments made by their two children and five grandchildren over the years. In a guest bedroom, Carolyn has stacked older suitcases, leaving the top one open to display Christmas photos from her family’s past. In the same room, she has an impressive display of scenery paintings in a variety of settings and sizes. This is the third time the McKees have participated in the homes tour, and this is their third house they’ve showcased. “Kerwin is good with fixer-uppers,” Carolyn said, noting he completed the tile work in the upstairs bathroom shower, along with the floors. The McKees gather their family together on Christmas Eve where they always serve shrimp for dinner. They also attend a local Christmas Eve church service. Both natives of Holton, Kerwin has worked for the city for almost 20 years. He currently serves as the assistant city manager. Carolyn previously served as the director of the Holton/Jackson Chamber of Commerce. The couple purchased the former Bell Graphics building last year and have now renamed it The Gossip. Carolyn has transformed it into a store that offers a variety of eclectic goods. It also serves as an office for her new home decorating business. 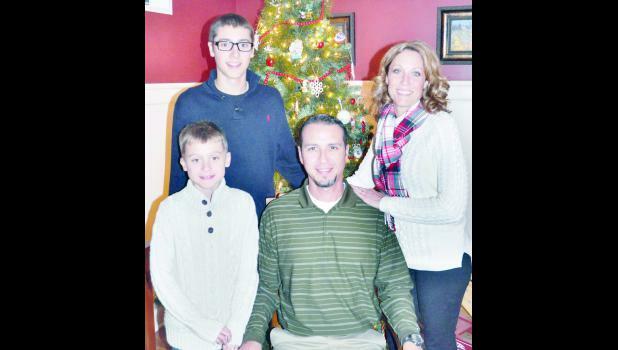 Christmas is about traditions for Brian and Nicole Meerpohl and their three sons, Ashtin, 24; Carson, 16; and Carter, 9. The family’s home, built in the 1940s, reflects those traditions in its Christmas décor and the sense of welcome one receives when they walk into the front door. The tree is a reflection of the family, filled with handmade and store-bought ornaments, Christmas lights and a crochet angel at the top. Homemade stockings – sewn by Nicole’s grandfather – hang above the fireplace. A ball of mistletoe hangs in a doorway. “There was always mistletoe for Christmas in my home growing up,” she said. The home also features wreaths and garlands and smaller Christmas trees in the boys’ rooms. “We have a KU tree and Star Wars tree,” she said. There’s also another tree in a play area full of homemade ornaments. Although the homes tour is scheduled during daylight hours, the Meerpohls dress up the outside of their home as much as the inside each year with white Christmas lights. “The previous owners had red outdoor Christmas lights so we knew we had to carry on that tradition in some way,” she said. The couple purchased the home 11 years ago. They are the fourth family to own the home. Several renovations have been made to the home over the years. A sunroom was converted into the master bedroom, the basement was finished, a bathroom was remodeled and the kitchen was recently updated. The family sits down to watch “It’s A Wonderful Life” and “A Charlie Brown Christmas” every year. Sugar cookies are always made and decorated, too. Brian and Nicole are both Holton High School graduates. Brian has been teaching for 21 years, with 16 of those in Holton. He teaches seventh-grade math. Nicole has been practicing optometry since 1999. She is co-owner of Lifetime EyeCare in Holton. Tickets must be purchased in advance. For more information about the homes tour, call the Chamber office at 364-3963.